• Aortic Dissection: Are You Missing the Diagnosis? • Cranial Nerves: When Is It an Emergency? • What's the Big Deal with FOAMed? Michael Grasso, MD, PhD, and David Jerrard, MD, in collaboration with Clare Grasso, PhD, from UMBC’s Department of Computer Science and Electrical Engineering, co-authored the article titled "Prescriptions Written for Opioid Pain Medication in the Veterans Health Administration Between 2000 and 2016," which was published in the November/December issue of the Journal of Addiction Medicine (2017;11:483-8). The investigators used a national cohort that documented 2.5 billion outpatient visits, 18.9 million ED visits, and 12.4 million hospital admissions. The number of opioid prescriptions peaked in 2011, when they were written during 5% of outpatient visits and 15% of ED visits. By 2016, opioid prescriptions were down 37% in outpatient clinics and 23% in EDs. Prescriptions for hydrocodone and tramadol increased markedly between 2011 and 2015. Opioid doses in inpatients settings rose until 2015. Jon Mark Hirshon, MD, MPH, PhD, has been elected to a second 3-year term on the Board of Directors of the American College of Emergency Physicians, the national medical specialty society representing emergency medicine, with approximately 38,000 members. The organization is committed to advancing emergency care through continuing education, research, and public education. George Willis, MD, our department's Director of Undergraduate Medical Education, is the 2017 recipient of the National Junior Faculty Educator of the Year Award from the American College of Emergency Physicians. The award was presented at the organization’s Scientific Assembly, held in Washington, DC, in October. Amal Mattu, MD, co-authored the article titled “How Do We Balance the Long-Term Health of a Patient with the Short-Term Risk to the Physician?,” published in the October issue of The Journal of Emergency Medicine (2017;53:583-585). His collaborators in this consideration of the evaluation, disposition, and outcomes of patients with low-risk chest pain were Michael Weinstock, MD, from Wexner Medical Center, Ohio State University, and Erik Hess, MD, MSC, from the Mayo Clinic. Jon Mark Hirshon, MD, MPH, PhD, is the principal investigator of “Wound Fluid as Regulator for Extracellular Matrix Remodeling and Recurrence in Inflammatory Breast Cancer,” a study funded by the Fogarty International Center at NIH in the amount of $322,060. The purpose of this project is to seek biological factors in wound fluid that foster dissemination of carcinoma cells throughout the body, making the disease resistant to radiation and chemotherapy. The research will be conducted by faculty members at Cairo University and Ain Shams University in Egypt, working in collaboration with Dr. Hirshon as well as colleagues at MD Anderson Cancer Center in Houston. The study period began in September 2017 and extends to mid-2019. Mike Winters, MD, and Joe Martinez, MD, with Haney Mallemat, MD, now at Cooper Medical School of Rowan University in Camden, New Jersey, and William J. Brady, MD, still at University of Virginia School of Medicine in Charlottesville, published a review of recent critical care articles, covering the topics of neurocritical care, cardiac arrest, mechanical ventilation, and sepsis. Their article is in this month's issue of the American Journal of Emergency Medicine (2017;35:1547-1554). How Long Does It Take to Run from Cumberland to Washington? 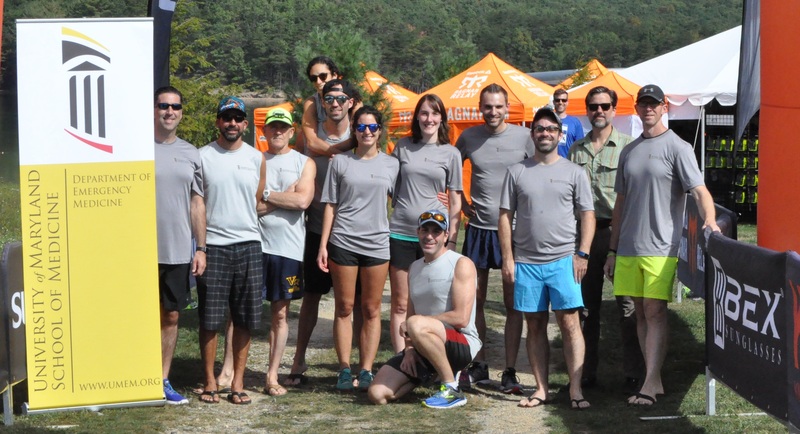 On September 22 and 23, a team from the Department of Emergency Medicine competed in Runragnar (www.runragnar.com), a running event that started in Cumberland, Maryland, and finished in Washington, DC. Each participant ran a leg of the journey, ranging from 11 to 26 miles, while the other team members, driving in two vans, monitored the progress of the runner and prepared for their time on the course. The EM UMDSOM team consisted of faculty members Mike Abraham, Mike Winters, Joe Martinez, Gentry Wilkerson, Wade Gaasch, and Dan Haase; residents Jon Strong, Carmen Avendano, and Megan Kirk; residency graduate Michael Allison; ICU nurse Jennie Orloff; and Ted Murphy, a “friend of the family.” They completed the 200-mile course in 29 hours, finishing 14th of more than 300 teams. Kristin Cioffi, BA, Human Resources Manager in the administrative office of the Department of Emergency Medicine, recently passed the certification examination of the Society for Human Resource Management. The 4-hour exam includes 95 knowledge-based questions, 65 situational judgement items, and 30 field-test items on the topics of leadership, ethics, communication, cultural effectiveness, business acumen, employee relations, and diversity. T. Andrew Windsor, MD, and Kami M. Hu, MD, both collaborating with Amal Mattu, MD, are the lead authors of two chapters in Observation Medicine: Principles and Protocols, published by Cambridge University Press in September. Dr. Windsor wrote on the topic of syncope and Dr. Hu on stress testing.